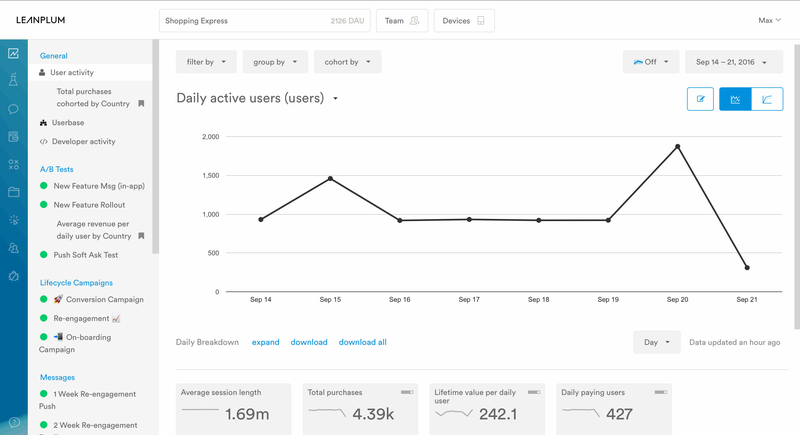 A quick and cost effective mobile analytics tool. It is a powerful mobile analytics platform which helps you to build long-term customer relationship. 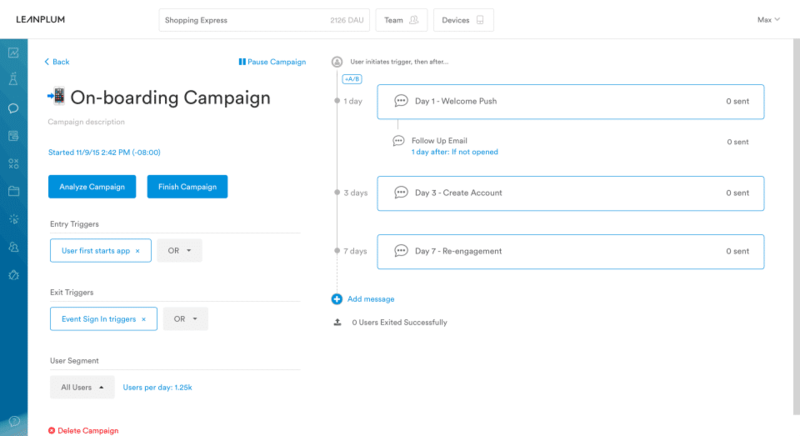 It will allow you to manage campaigns in multiple messaging channels and it has optimization assistance which will improve the effectiveness of every campaigns. In addition, it has impact clarity feature which will help u to understand the impact of all campaigns. Using this software, you can send targeted messages to the consumers through push and email notifications. In addition, this software will allow you to send personalized messages and it also has predefined templates which can be used in the campaigns. How much does Leanplum cost ? 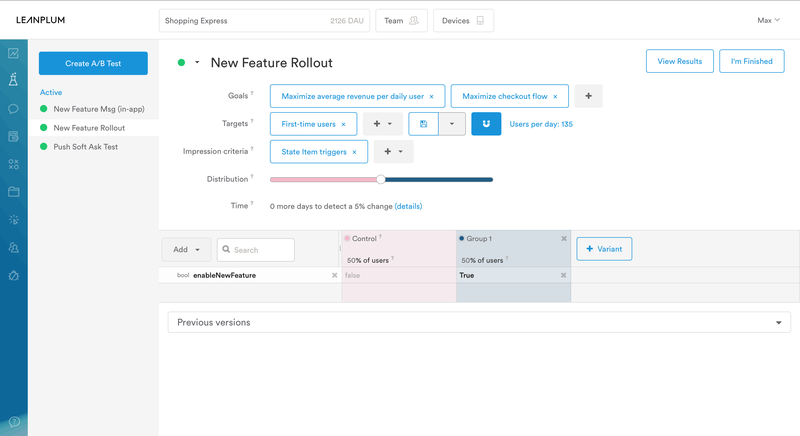 Leanplum provides a custom pricing for their software. We would love to show you how top brands use Leanplum to build meaningful relationships with their users. We help brands orchestrate multi-channel campaigns from messaging to the in-app experience all from a single, integrated platform. 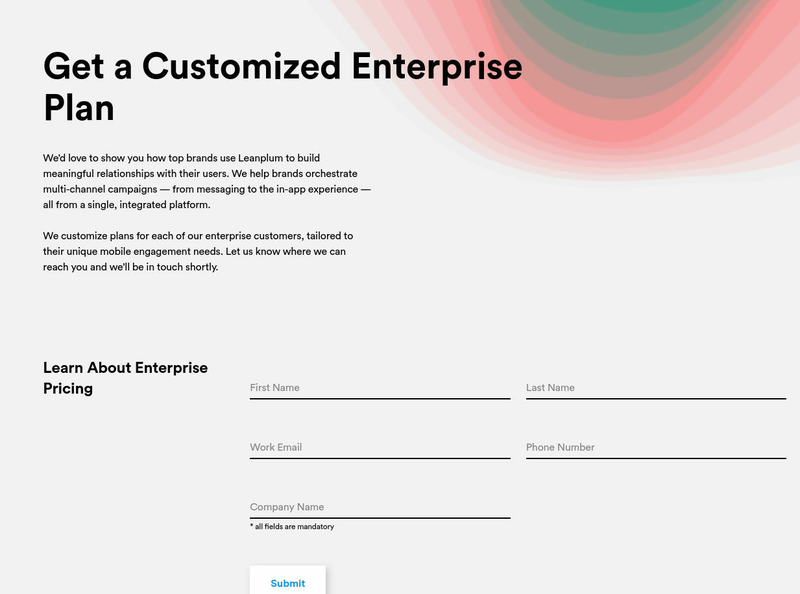 We customize plans for each of our enterprise customers, tailored to their unique mobile engagement needs. Let us know where we can reach you and we will be in touch shortly. Pros: I like how Leanplum makes it easy to group messages in a campaign into a folder or a series of messages. It's also very easy to see the engagement level of a group/campaign as well as engagements on a single message. I also like the file management system - it seems simple but it is nice to have files stored in-app ready to be dropped into a campaign or message. Cons: Searching for messages by content be a little tricky if you have a lot of them. Otherwise though I have nothing negative to say about Leanplum! Overall: Solid delivery and execution of our platform's messaging. Positive impact with workflow "cart abandon" emails. Positive impact with the ability to split test emails. Negative impact with Revenue data... not always accurate/tells the whole story. I would rate over all a 6. Compare with similiar soft ware before purchasing. For sending out a messages to all application users (without having them update) or at least quite a large number of them is one of the best uses for Leanplum. Customers do not update their software quite as often as developers would like them to. While Leanplum does track some data it does not track that metadata quite as well as some of the data systems out there. 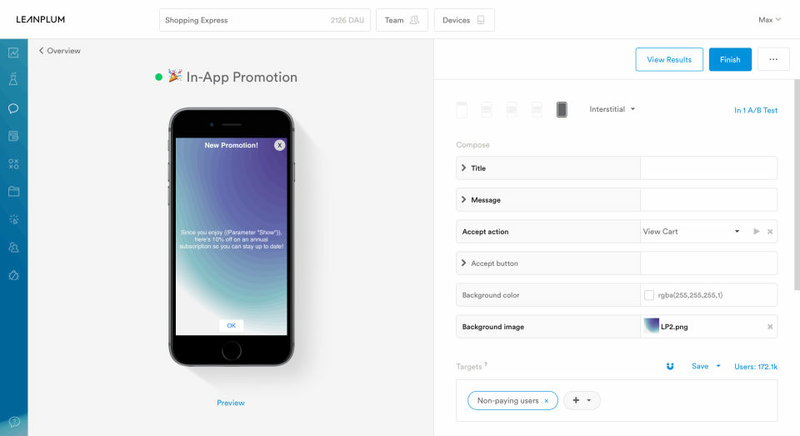 "A good push notification and mobile customer engagement platform"
Overall a solid interface and pretty easy to use. The layout of campaigns on the main dashboard could be redesigned better. Currently row-by-row list of campaigns. It'd be nice to be able to organize, bucket, and customize the layout into a more flexible and user-friendly view. (It's not always ideal to simple sort by date, name, # of sends, etc.). It's our push notification platform. We use it to engage our customers on mobile. We've seen really strong engagement levels via mobile push. We particularly like the fact that one can utilize push notifications, Email, In-app messages seamlessly. We solve the problem of getting referred customers to become paying customers using the software. "Leanplum - great customer service and sales team"
I think that their analytics reports could be a little easier to interpret for higher level execs. They can be a little jargony. 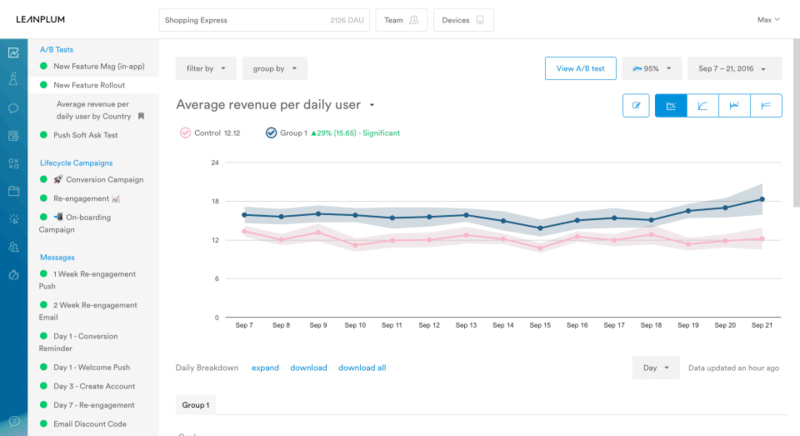 We use leanplum for A/B testing which is greatly helpful in understanding which elements of our software we want to push forward. I really think their sales and customer support at top notch. Their dashboard tools could certainly use better flexibility. They are a little cookie cutter as is. A lot of features with little follow through. It's a comprehensive tool both A/B testing and sending notifications. The UI in general. The display of A/B test results are difficult for inexperienced users to understand and interpret. I would compare to a tool that would be typically be built in house. Users need a little more hand holding than Leanplum offers. Support is probably the worst part of the Leanplum experience. Problems with tools are expected getting help has be a chore with Leanplum. If you need Leanplum get an idea what your support experience is going to be like. We use Leanplum for A/B testing and feature gating. Pros: Overall, once you get the hang of it, it's pretty easy to execute on campaigns. 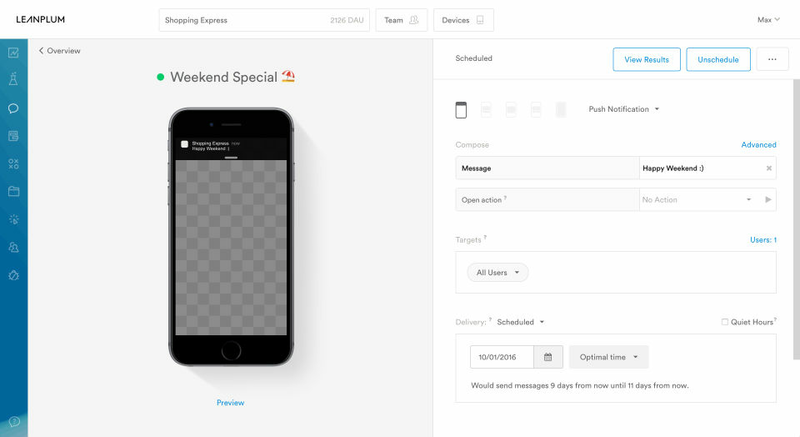 Pretty versatile platform with different sending, messaging, and targeting options. Cons: The analytics could be more robust... some reports I want aren't available from the analytics dashboard. For example, I can't pull a consolidated report of a particular triggered event across a defined set of push campaigns. Also, the process of searching for attributes is done via a dropdown list, which is inefficient. I wish I could just search for attributes that I'm looking for. Would save me some time. Incredibly easy to customize the platform to work for exactly your business. Once the platform has been implemented, its a turn key operation to segment customers and hit send on pushes, in-apps and emails. While I find the UX very intuitive and easy to use generally, many of my colleagues struggled with it a bit. Also, it does have it's quirks and there was a learning curve. It is also definitely a b2c product, would not recommend for b2b focused businesses. Make sure to have all your requirements long before you begin implementation. 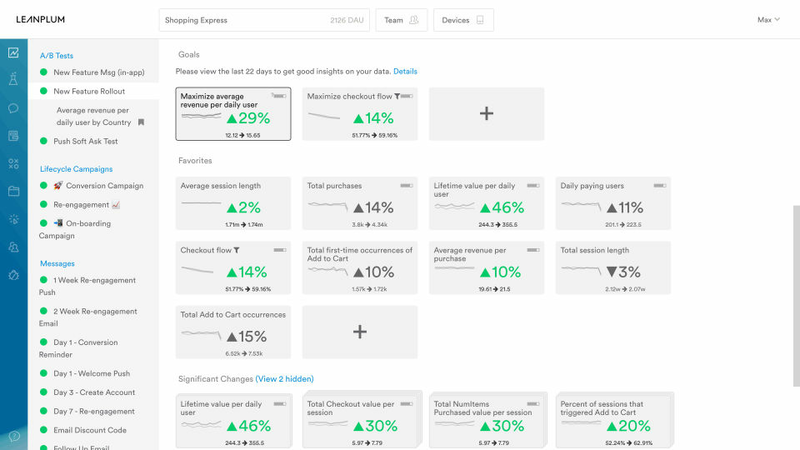 Leanplum is incredibly powerful but to get the most out of it, it's best to have pre-designed your use cases and then make sure you have the data you need to solve the use case. I would advise paying particularly close attention to date stamps and time formats, this is incredibly important for many use cases and given there are many different potential formats, this can cause major issues. Specify everything with your team upfront if you can. Building a marketing automaton platform that can manage b2b and b2c marketing including loyalty rewards program. Because of the power of this platform, we have been able to implement a number of marketing programs that leverage customer-specific data for better segmentation and targeting. Using the tools, we have also been able to optimize many of our campaigns, and focus our efforts where we are most successful.